When is it legal to take stuff from the trash? 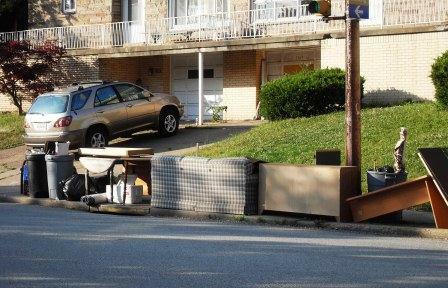 Usually, property that is left for trash collection is considered to be abandoned. It is perfectly legal to take abandoned property, but it isn’t always easy to tell if property is truly abandoned. The picture here shows household furnishings alongside trash cans left on the strip of grass between the sidewalk and the street just hours before the garbage truck is due. Obviously, those household furnishings have been left for trash collection. But what if the chairs and desk were there without trash cans nearby or not on trash collection day? In those circumstances, it wouldn’t be so clear that this property was being abandoned. The owners might be planning to move it somewhere or to have friends come and get it. A safe way to avoid legal problems is to ask the owner if you can take the stuff. If the stuff was next to or even inside of trash containers and those trash containers, whether dumpsters or ordinary trash cans, were on private property, then the stuff might not have been abandoned. The owner might still be thinking about taking it back into the house. If the stuff wasn’t abandoned, then taking it away without the owner’s permission is the crime of theft. If you go onto private property to look through a dumpster or trash can, you can be charged with trespassing. When you go to do legal research about trash ownership and abandonment, you are not likely to find much relevant information in the category of theft. However you can find relevant cases and law journal articles in Google Scholar if you search for the words “dumpster” and “trespassing” in the same search. 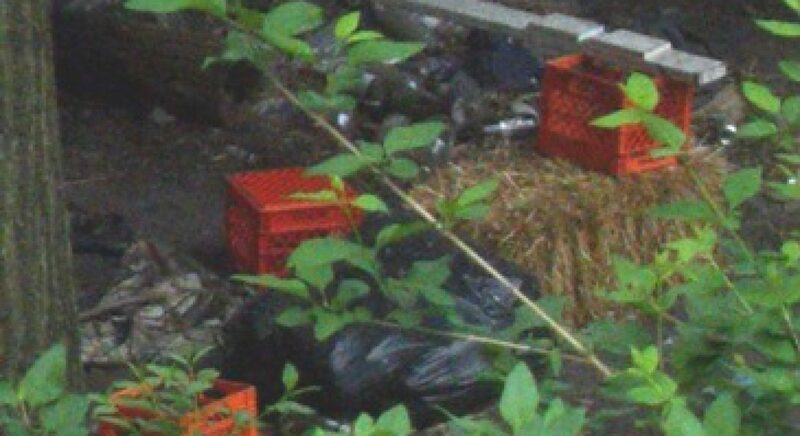 Reading those cases, you can get an idea of how courts analyze whether property was abandoned and whether looking in a dumpster was a trespass in that particular case. Here is one example in which somebody went hunting for discarded documents in a dumpster at a Walt Disney facility. Searching for “dumpster” and “abandoned property” in Google Scholar, you will mainly find cases and articles about police conducting searches and seizures by going through trash containers. Even the police cannot look in or take non-abandoned trash without permission of the owner or a judge who has issued a search warrant. Here is one case with a good clear explanation of the law of abandoned trash. Smith v. State 510 P.2d 793 (Supreme Ct. Alaska, 1973). Here is the seminal Supreme Court case on the topic of police access to abandoned trash. California v. Greenwood 486 U.S. 35 (1967). Under the law, what happens if a homeless person is found dead and nobody knows who it is? State laws require coroners and medical examiners to investigate unexplained deaths and deaths that are likely to have resulted from a crime (attack, illegal drug use, etc…). So, if you die outside, in an abandoned building, or at a shelter or anyplace else outside of a hospital without having had a recently treated medical condition, the coroner or medical examiner will have to figure out the cause of your death. This might be a quick death scene evaluation where they can quickly determine that the victim died of exposure or it might be a longer investigation at the coroner or medical examiner’s lab. In connection with determining the cause of death and issuing a death certificate, the coroner or medical examiner typically has a legal obligation to identify the person who has died. This might involve going through the decedent’s possessions, accessing police records, tracing dental records, searching through databases of missing persons, tracing DNA… The state’s “disposition of body” or “vital records/ death certificates” law will likely list some investigative steps for coroners and ME’s needing to identify bodies. If the law does not list investigative steps, the guidelines for these investigations could arise from coroners’ professional standards published by the state coroners’ or medical examiners’ professional association or else an internal policy manual for the particular county coroner or medical examiner’s office. See also the FBI site that lists found remains of missing and unidentified persons. Read Nancy Ritter, Missing Persons and Unidentified Remains: The Nation’s Silent Mass Disaster, NIJ Journal issue 256 (January 2007) https://www.ncjrs.gov/pdffiles1/nij/jr000256.pdf which is a Department of Justice article about use of the state and federal missing person registries. These manuals are not easily available. Here are the standards for autopsies. https://netforum.avectra.com/temp/ClientImages/NAME/eed6c85d-5871-4da1-aef3-abfc9bb80b92.pdf If it isn’t available in your public library or the county law library, you might find excerpts posted on the county medical examiner’s Web site which you can navigate to via http://www.statelocalgov.net/. Examples: New York. Social Service Law Section 141; California Health and Safety Code Section 7104; Nevada Revised Statutes Chapter 451.400; DC Code Title 5, Chapter 14, Part 11 (5-14-11); Official Code of Georgia Title 31 Chapter 21. Examples: Texas Health & Safety Code Section 691.023; Colorado Revised Statutes 12-34-201; Florida Statutes Chapter 406 Part 50. Examples: Ohio Revised Code 1713.34; Arkansas Code Title 20, Chapter 17, Subchapter 7; Delaware Code Title 16 Chapter 27 part 02. Is it ever illegal to sleep in public places? According to the trespassing laws shown in the post about abandoned places, remaining in a public building after hours is a form of trespassing. [i] That means that it would be illegal to sleep in City Hall or the public library or another public building after operating hours. Another way the law can prohibit sleeping in public places is with a local curfew ordinance declaring that certain outdoor spaces are off-limits at particular times. Curfews might apply only to juveniles or else to geographic locations such as entire parks or sections of them, neighborhoods, or whole cities. Curfew laws have been contested enough over the years that cities now write them to avoid compromising Constitutional rights to assembly and travel. [iii] Some courts find that curfews are perfectly legitimate as long as they include exceptions for actions like traveling from a job or participation in something of benefit to society. Laws specifically against sleeping or resting outside, the third way of making it illegal to sleep in public, are also known as “anti-homelessness” laws. In August of 2015, the Department of Justice filed a statement in the case of Bell v. City of Boise (Link to the earlier trial court decision.) telling the court that it is unconstitutional to have laws prohibiting life on the street when there are not enough shelters to house the people who cannot afford housing. In the same month, the U.S. Interagency Council on Homelessness issued a community guide titled Ending Homelessness for People Living in Encampments. This guide advises communities of ways to develop permanent housing opportunities for homeless people. When looking at all of these different ways the laws prevent people from sleeping in public you might wonder how anyone would even know when and where sleeping isn’t allowed. It is probably easiest to avoid trespassing or violating a curfew because there are usually printed warnings telling when people can’t be in a place. There might be a sign telling when the library is open; anyone there at other times knows that he shouldn’t be there. There might be curfew notices posted in a park or other outdoor spaces. But the anti-sitting, camping, or sleeping ordinances do not usually come with any advance notice to first-time violators. There is no requirement that people have to know about laws before getting charged for violating them. It is required, however, that federal, state, and local laws comply with the rights established U.S. Constitution such as due process,[ix] freedom from illegal searches and seizures,[x] free speech[xi]… No matter which constitutional right is claimed, the law’s effect will be compared to its purpose. As long as laws about sleeping in public are written to serve a legitimate government purpose and are rationally related to that purpose,[xii] they will be found constitutionally acceptable. When reading the full case decisions that were summarized above, pay attention to how the court talks about purpose to see how to make arguments in your own case. [i] Model Penal Code § 221.2(1) (1962), says that “surreptitiously remaining” on property is trespassing. [ii] “A Dream Denied: Criminalization of Homelessness” and “Illegal to be Homeless” are some of the titles used by the National Coalition for the Homeless in their annual summaries of laws and local government actions against homeless people, available at http://www.nationalhomeless.org/publications/reports.html. These reports have numerous examples of laws enacted to prevent the homeless from sleeping in particular public places and they tell how homeless advocates have responded to the laws. [iii] Freedom to assemble is in the First Amendment to the US Constitution. U.S. Const. amend. I. The right to move about freely, which cases often refer to as “travel”, has been interpreted from the Fourteenth Amendment. U.S. Const. amend. XIV. [iv] Curfew cases are often not major enough to be appealed and published in case reporters. Since the ACLU frequently disputes curfews, a good place to read about them is on the ACLU’s Web site http://www.aclu.org/. There you will find news stories about curfew cases and samples of documents filed in cases contesting actual curfew laws. [v] City of Seattle v. McConahy, 937 P.2d 1133 (Wash. Ct. App. 1997). [vi] L.A., Cal., Mun. Code § 41.18(d) (2005). [vii] Jones v. Los Angeles, 444 F.3d. 1118 (9th Cir. 2006). The prohibition against cruel and unusual punishment is the 8th Amendment to the U.S. Constitution: “Excessive bail shall not be required, nor excessive fines imposed, nor cruel and unusual punishment inflicted.” U.S. Const. amend. VIII. The San Francisco ordinance against sitting and lying on sidewalks between 7:00a.m. and 11:00p.m. is Section 168 in the “Disorderly Conduct” part of the Police Code. [ix] U.S. Const. amend. XIV. [x] U.S. Const. amend IV. [xi] U.S. Const. Amend. I. [xii] Comparing the government’s purpose against the way it has written a law to see if there is a rational relationship between them is called “rational basis scrutiny” and is explained in legal encyclopedias such as American Jurisprudence and Corpus Juris Secundum and in books about constitutional law which are generally in the KF 4550 call number range at libraries.